Her life was a lei, a circle of love which began and ended within 2 feet of the same spot. She was born one February night, maybe 14 years ago, along with 9 other siblings. 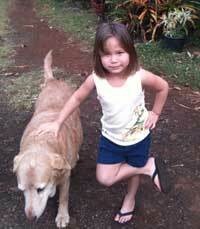 Her mother, Hoku, labored into the wee hours as she paced the small space next to the washer and dryer, inside the back door of our home. I patted & encouraged her as she produced puppies 2 at a time, with about 40 minutes between sets. Keakamai was the 2nd of the first pair, small compared to her brothers and sisters. "Why do you want to keep this one?" asked the vet. " She is the runt and looks like she will always be into mischief." We named her "Keakamai," "the clever one," but we called her mostly "Keaka," "the Mirror" ( a name we had also given as a Hawaiian name to our son Jesse). Our granddaughter, Lea, dubbed her "Cupcake," a name of endearment which depicted the relationship of a loving little girl with a loyal doggy friend. The first time that I heard Lea really laugh ( she was 3 or 4 months old) was in response to the 3 dogs' Mother, Brother, and Keaka - as they came running past us while I walked with baby Lea in my arms. It was a spontaneous burst of surprised joy that bubbled up from deep in her belly. As she grew older, Lea would love to feed the dogs: 1-2-3 bowls in a row, set in their own spot. She would back up unto the stoop outside the back door to watch them eat. "They like it, they like It" would be her continuous mantra. Over the past 30 years of dog ownership, I have been impressed with the way that dogs teach us about unconditional love. They are never impatient or judgemental. They are happy to be fed whenever we get home. They are always happy when we return. They are not upset if they get wet in the rain, and if it is hot, they will just find the shade of a tree. They are always ready to be good company, to take a walk, or just sit by your side. And we are attracted to them, for although it appears that we are taking care of them, on some subtle level we understand that they are our teachers in learning patience, acceptance, and gentleness from them. Hoku, the mother dog, and Radagast (the brother whom we later inherited) both died within a day of each other of unrelated causes. Keaka (lucky dog) had never been without her mother grooming, licking, leading, and providing a warm body to curl up next to. Then again, Keaka now had the opportunity of being the "only dog" - getting all the leftovers, going to the beach more often, and generally getting all the attention that was available for a dog given our busy lives. But how could a dog complain when she had over an acre to wander through, when she could hear us in our home office and smell Dr. Basko's dog stew being made for her, and when she could rest under the cool trees outside our breakfast nook and watch us through the large windows as we ate our meals. That is where her body rests now, in the bamboo grove behind the large orange tree that produces the sweetest oranges in the world. We can sit at our table and see the green ti plant that marks her grave. Her death was as gentle as her life. We had noticed for some time that she was markedly slowing down, not that interested in food (amazing), and not jumping up to take walks even around the property. Yet, about 3 weeks prior to her passing, she was swimming with us at Anini Beach and watching over 4 yr. old Lea as she floated with her Poppy on the slow current. Keaka had to be lifted in and out of the truck but she had no complaints and seemed happy to be included. Eventually, over the next couple of weeks, she just stopped eating (she would lick at the food just to please us it seemed). She started staying in her bed even into the day and then got to wandering about and wouldn't return to her bed as though looking for a place of comfort. In the end, we carried her back to her bed outside the back door, making it as private as possible. On the morning of July 3rd, Michael checked on her and then checked again a little later, having the intuition to do so. He called me out to be with her as she took her last gentle breath. We miss her. There is an empty feeling. We are still surprised by the new routine. No need to get home to feed the dog, no dog to greet us at the car, no dog food to prepare, no dog to give the leftovers to. But then, she lived a sweet life with people who loved and cared for her in a place of beauty and serenity. Perhaps this was her last incarnation, a reward for lifetimes of good Karma. Certainly she did not have the worries or concerns of the human community around her. As we said our farewell prayers - a Buddhist puja to release her spirit, a Hawaiian Chant to guide her to the heavens - I could not help but think that hers was a blessed way to live and hers was a blessed way to die. Lea does not like this ending. She would rather imagine that Cupcake has become a butterfly, eating from the crown flower tree in our yard, or maybe even that she is the breeze in the trees that she loved. That could be Keaka's choice as well.